Aso Villa Chapel in Abuja, Nigeria. 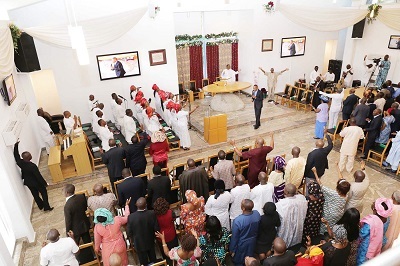 The Aso Villa Chapel, in Abuja, Nigeria, in conjunction with some churches, has commenced a 725-hour (30-day) non-stop praise concert towards a peaceful general election in the country. Pastor Seyi Malomo, the chaplain of the Chapel, made this known in an interview with the News Agency of Nigeria (NAN) in Abuja yesterday. According to the Independent National Electoral Commission (INEC)’s timetable, the Presidential and National Assembly election will be on February 16, while the Governorship and State Houses of Assembly poll will be on March 2. Malomo said the praise concert programme is organised with the aim of inviting Almighty God into the election in order to have a peaceful and violent-free exercise. “What Aso Villa Chapel is doing, which is in conjunction with other churches, is through the agency of praise, to invite He, who is called the Prince of Peace into the election. On the composition of churches, he said: “When you talk about churches, you talk about CAN, when you talk about CAN, you talk about churches. “Well, Nigeria is a party that all of us first belong to, irrespective of the political parties that we are in. We should know that Nigeria is first. “By our votes, if you are not elected, you take it that you have not been elected. Nigeria goes on! According to him, the programme is open to all Nigerians; the big, the small, the VIPs, the ordinary, the pastors — everybody is invited and they will be blessed by it. Malomo said the event, which began at3pm on February 3, would come to an end on March 5 at about 8 pm. “Like I said, it started on February 3, and it will run all through the two elections; the presidential election and the state poll which is the last one,” he said. According to the chaplain, participants and those singing, who are eligible voters, will take turns to exercise their franchise on election days. “They will take turn; go and vote and come back. Those who don’t have PVCs, because they are below voting age, won’t go.